More than 40 percent of the food produced in the United States is never eaten. That’s a staggering amount of food waste! But what can be done to change that? It’s a sobering reality. Hunger is on the rise across the globe, but so is food waste. As many as 1 billion people globally go hungry, while 1.3 billion tons of food go to waste. But while the numbers seem astronomical, this is an issue where we can make a difference — starting in our own households. And it doesn’t have to be difficult either. Small steps can make a big difference. Reduce food waste by planning ahead. This one seems simple enough. But when your days get chaotic, it can be hard to even think about adding one more thing to your plate. That’s why advanced planning is important. A little forethought before making a weekly trip to the grocery store can help cut down on the amount of food waste your family has. First things first: don’t go shopping for food without a list. Just don’t! And while we’re offering suggestions, don’t go grocery shopping when you’re hungry either. Both scenarios can lead to purchasing unnecessary and/or unhealthy items. Plot out your family’s meals for the week, considering the ingredients required to prepare each meal. Look through your kitchen to determine what ingredients you have and what ingredients you need. This is also a good opportunity to gauge what meals you can make out of the foods already in your kitchen, limiting what you need to buy and ensuring the food you’ve already purchased will be eaten. At the grocery store, limit your purchases to what’s on your list — and only purchase enough to prepare the meals and snacks you have in mind. Reduce food waste by prepping foods ahead of time. How often do you come home from the grocery store and just toss your purchases into the fridge or onto the counter? More often than you should, probably! Instead of putting things away quickly, take some time to think through how the items will be prepared and when they will be used. Proper storage is essential for ensuring foods don’t go bad before you’re able to eat them. Go ahead and prep your food items immediately after getting home — wash produce and chop it, dice it or otherwise make it ready to grab and go or prepare. Freeze items like bread or meat that you won’t be preparing or eating in the next couple days. You may also want to food prep, cooking up meals and then freezing them to be eaten at a later time. Do whatever is necessary to make it more likely you’ll eat everything before it goes bad. Reduce food waste with proper storage. This tip goes hand in hand with the one just above. In fact, we talk through storage in our prepping strategy. 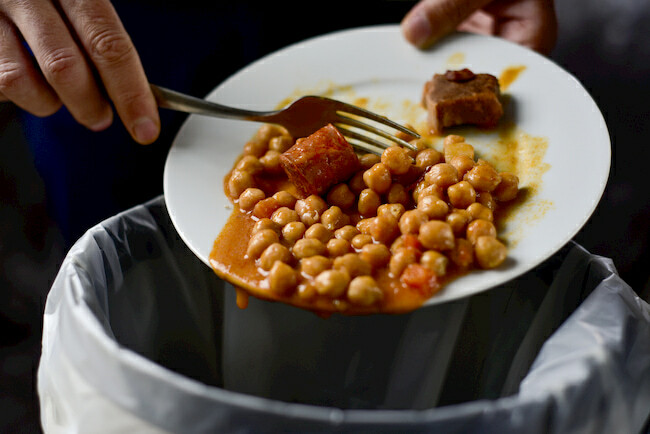 But proper storage is so important for preventing food waste that it deserves its own tip! Meat should be stored in the fridge if you’re preparing it within 24 hours. It should be stored in the freezer if it won’t be cooked within that timeframe. Bread can be frozen if you won’t eat it before its expiration date. When you defrost the bread, it will be fresh and not stale. Fruits and veggies can be eaten fresh, frozen or even canned. Carefully consider when you plan to eat your produce, then determine how to best store it. Some other pointers for properly storing fruits and veggies include not washing berries until you’re ready to eat them to avoid mold and storing certain fruits, like bananas and apples, by themselves. The reason for the latter is that those fruits give off gases as they ripen, which can cause other produce to spoil more quickly. Reduce food waste with a little thriftiness. Shop your fridge before buying something else to prepare for dinner. Use up remnants of veggies and fruits in things like soups, casseroles, sauces, smoothies and baked goods. Find ways to use the parts of foods you’d usually toss out — turn old bread into croutons and veggie scraps into stock. Turn your leftovers into a new meal. Learn about the differences between labels on packages, then use that information to monitor the foods you have in your kitchen. Reducing food waste is one of many ways you can minimize food expenses as you shift toward a healthier lifestyle. Want more guidance? Our Living Well workshops are free, or available at a nominal cost, to help you manage chronic conditions and improve your overall health. Learn more at Erlanger.org.